Photo credit: Cindy Kurman, Kurman Communications, Inc.
Craving some sweet, melt-in-your-mouth milk chocolate? If the answer is “yes,” then we have some good news for you! Tuesday, July 28 is National Milk Chocolate Day, and what better way to satisfy your milk chocolate craving than with a heavenly serving of Milk Chocolate Bread Pudding at Luella’s Southern Kitchen (4609 N. Lincoln Ave.; 773-961-8196). 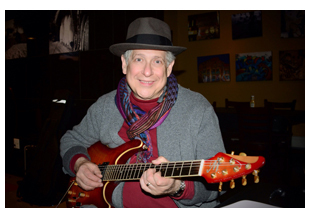 Add a performance of contemporary jazz from guitar wiz Lee Alec Barrie from 6:30 – 8:30 p.m. and you have quite the Tuesday night party! 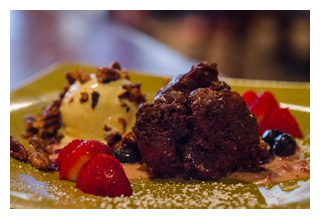 Not only is Luella’s Milk Chocolate Bread Pudding ($6) handcrafted by Owner/Chef Darnell Reed himself, but it is served with a scrumptious strawberry jam anglaise and homemade praline ice cream. Chef Reed knows just what it takes to make this bread pudding melt in your mouth, just like any piece of milk chocolate would. The Milk Chocolate Bread Pudding is usually served during brunch, but Chef Reed is making an exception for the holiday and will be offering it all day on Tuesday, July 28. What makes milk chocolate special is the addition of one of the following: liquid milk, milk power, or condensed milk. One of the most closely-guarded milk chocolate recipes belongs to Hershey’s, but Luella’s ingredients are no secret. To find out what makes their Milk Chocolate Pudding so delicious, head over to Luella’s Southern Kitchen and have a taste for yourself! Darnell Reed is a graduate of Washburne Culinary Institute in Chicago. He began his professional career in 1997 at the Palmer House Hilton where he served as Restaurant Chef at the French Quarter and the Big Downtown. In 2005, he was promoted to Executive Sous Chef at the Embassy Suites Chicago Lakefront where he handled banquet functions for up to 700 people. In April 2007, Reed was promoted to the dual Executive Chef position at the Hilton of Oakbrook and Hilton Garden Inn of Oakbrook. In May of 2010, he accepted the Executive Sous Chef position at the Conrad Chicago Hotel and was promoted to Executive Chef in 2011. 3 p.m. on Saturday and Sunday; dinner is served until 10 p.m. on Saturday and 8 p.m. on Sunday. All major cards are accepted. Luella’s is a BYOB establishment; no corkage fee is charged. Takeout and delivery service are available. For more information, call the restaurant at (773) 961-8196 or visit the website at www.luellassouthernkitchen.com. Lee Alec Barrie is an accomplished contemporary jazz guitarist and guitarist synthesist who has been setting the mood for audiences for years with his creative mix of contemporary jazz, smooth jazz radio hits, instrumental pop and romantic bossa nova, backed by fully arranged recorded accompaniments. Foods so delicious and quintessentially American are honored with their own food holidays, and nothing says “America” quite like a serving of crispy French fries or a generous helping of mac & cheese. Celebrated one right after the other, National French Fry Day is July 13, and National Mac & Cheese Day is July 14. Whether you eat them as an entrée, side or afternoon snack, both are guaranteed to hit the spot. At Luella’s Southern Kitchen (4609 N. Lincoln Ave.; 773-961-8196), Owner/Chef Darnell Reed gives some southern flair to the American classics. seasoning, giving them the southern spin they need to complement his dishes. At Luella’s, French fries come as a side with multiple dishes. They accompany the Pimento Cheeseburger ($11), the Soft Shell Crab Po’ Boy ($15), and the Fried Green Tomato BLT ($11). And don’t worry, Luella’s hasn’t forgotten about the kids! A side of fries ($3) is included on the kids menu, but you don’t have to be a kid to enjoy them. Reed also puts a Southern twist on the beloved mac & cheese. His BBQ Brisket Mac & Cheese ($11) expands on the classic dish with the addition of tender brisket cooked to perfection, a creamy Mornay sauce and buttered bread crumbs. You haven’t truly experienced mac & cheese until you taste it prepared like this. This year, don’t be a small fry! Head over to Luella’s Southern Kitchen and celebrate National French Fry Day and National Mac & Cheese Day like you’re below the Mason-Dixon Line. Luella’s is closed on Mondays, so you will have to pack in both celebrations into one day on Tuesday, July 14. And if you like what you taste, check out the BBQ Brisket Mac & Cheese recipe below. Whip it up for friends and family to keep the festivities going all summer long. Place the heavy cream, cheese sauce and American cheese in a pan and bring to a simmer. Add the brisket and continue to simmer until the meat is heated through. Add the pasta and season it with salt and pepper. Toss the mixture, letting the sauce continue to form and thicken until it coats the pasta evenly. Season more, if necessary, or serve with toasted bread crumbs. Melt the butter in a medium heavy saucepan over medium heat. Add the onion and a pinch of salt and cook slowly, stirring occasionally for two or three minutes. Sprinkle the flour and cook for one to three minutes, stirring constantly so the roux doesn't brown. Whisk constantly. Add dry mustard, paprika, bay leaves and milk until no visible lumps. Turn heat to low and bring to a slow simmer, whisking occasionally. Continue to simmer and whisk until you achieve nappe consistency. Remove the sauce from the heat and season to taste with salt and pepper. Strain sauce, add cheeses and whisk to melt cheese. Rub the brisket all over with the barbecue seasoning mix. Smoke the fat side up at 215 degrees for about 12 hours, or one hour and 10 minutes per pound at the same temperature. Luella’s Southern Kitchen, located at 4609 N. Lincoln Ave. in Chicago’s Lincoln Square, is a casual independent restaurant owned by Chef Darnell Reed. The restaurant opened February 3, 2015. Luella’s serves lunch and dinner Tuesday through Friday from 11:30 a.m. to 10 p.m. Weekend brunch is served from 10 a.m. to 3 p.m. on Saturday and Sunday; dinner is served until 10 p.m. on Saturday and 8 p.m. on Sunday. All major cards are accepted. Luella’s is a BYOB establishment; no corkage fee is charged. Takeout and delivery service are available. For more information, call the restaurant at (773) 961-8196 or visit the website atwww.luellassouthernkitchen.com. Green City Market Chef BBQ Restaurant List Continues to Grow; Secure your tickets now. Green City Market’s 15th annual Chef BBQ benefit, taking place this Thursday, July 16 from 5:30 p.m. – 8:00 p.m. (VIP entry at 4:30 p.m.) in Lincoln Park, continues to add high-profile restaurants to their ever-growing list of participants. Complementing the BBQ’s 100+ chefs and restaurants are more than 30 of the Midwest’s best brewers, distilleries, wineries, and mixologists will feature locally made craft beer, wine, hand-crafted cocktails and non-alcoholic beverages. Green City Market Chef BBQ Attendees. With the BBQ only days away and Thursday’s forecast looking bright, now is the time to secure your ticket to Chicago’s most exciting food fest of the summer. Tickets to the benefit go a long way in helping Green City Market cover operating costs year-round. Green City Market Chef BBQ tickets can be bought online here. For more information on the BBQ including pictures from last summer’s benefit, visit the Green City Market Newsroom. New additions to the fabulous roster include chefs from hotels such as the Waldorf Astoria Chicago to Girl & the Goat Executive Chef Stephanie Izard’s upcoming Chinese restaurant Duck Duck Goat. Hospitality groups such as Element Collective (Nellcote, Old Town Social, Leghorn Chicken, RM Champagne Salon, Owen + Alchemy, Kinmont ) and One Off Hospitality Group (Blackbird, Nico Osteria, The Publican, Ladies of Pastry) also will be taking part in the highly-anticipated benefit. Prairie Grass Cafe's George Bumbaris and Sarah Stegner. 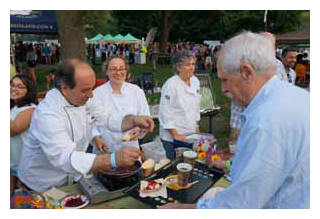 CHICAGO, IL, July 2015 — Twenty-one new restaurants will join Green City Market’s 15th annual Chef BBQ Benefit 5:30 p.m. to 8 p.m., Thursday, July 16 in Lincoln Park. The BBQ will showcase the who’s who of Chicago’s culinary scene, including this year’s new comers: Acanto, Arbor, Bar Takikto, Bohemian House, Bottlefork, Fork, Formento's, Frontier, HaiSous, Japonais by Mormioto, Lillie’s Q, Maddy’s Dumpling House, River Roast, Salero, Seven Lions, Taus Authentic Food, The Duck Inn, The Gage, The Kitchen, The Nomad Food Company and Villains Chicago. The list of new restaurants continues to grow, so be sure check the Green City Market website often to see what restaurants have been added. All dishes served at the BBQ feature items offered from the bounty of the market with over 100 chefs and restaurants creating culinary magic. In addition to food, more than 30 of the Midwest’s best brewers, distilleries, wineries, and mixologists will feature locally made craft beer, wine, hand-crafted cocktails and non-alcoholic beverages. For additional information, visit the Wirtz Beverage website at http://www.wirtzbev.com/drinks@chefbbq. Advance tickets are available through Brown Paper Tickets and at the Green City Market on Wednesdays and Saturdays. Check the Green City Market website at http://gcmchefbbq.brownpapertickets.com/. General admission tickets are $125; individual VIP tickets are $250. For the first time this year, VIP tickets may be purchased in various quantities, making it easy for companies and families to enjoy the special treatment in groups of whatever table configuration they want. VIP experience will feature elegant décor, with optional seating styles for tables of 2, 4, 6 or more. Large corporate cabanas seat 16 for $10,000 and include a dedicated server for food and beverage service. Logo recognition is available at the gold level as well as placement on cabana, step & repeat, and program. Private lounge grouping seats 10 guests for $5,000, including a small cabana, a dedicated server for food and beverage service and logo recognition at the silver level in program and on cabana. VIP ticket holders are treated to a special early VIP reception from 4:30 p.m. to 5:30 p.m. Guests are encouraged to purchase tickets early, as this event has sold out in past years. Visit the Green City Market Website for a complete list of participants. 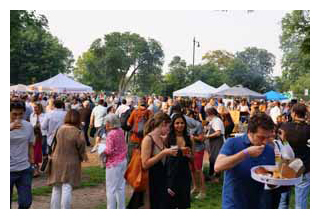 CHICAGO, IL, June, 2015 — Twenty-one new restaurants will join Green City Market’s 15th annual Chef BBQ Benefit 5:30 p.m. to 8 p.m., Thursday, July 16 in Lincoln Park. The BBQ will showcase the who’s who of Chicago’s culinary scene, including this year’s new comers: Acanto, Arbor, Bar Takikto, Bohemian House, Bottlefork, Fork, Formento's, Frontier, HaiSous, Japonais by Mormioto, Lillie’s Q, Maddy’s Dumpling House, River Roast, Salero, Seven Lions, Taus Authentic Food, The Duck Inn, The Gage, The Kitchen, The Nomad Food Company and Villains Chicago. The list of new restaurants continues to grow, so be sure check the Green City Market website often to see what restaurants have been added. "The Green City Market BBQ is one of the best events of the summer and a great time for all involved. The market is like a seasonal candy store for chefs, so it’s awesome to be able to support our farm community,” said Tony Quartaro, chef and co-owner of Formento’s and Nonna’s. Feast, Neighborhood Eats and Drinks Perennial Virant Three Floyds Brewing Co.
Lakeshore Beverage Three Floyds Brewing Co.
Greenstar Brewing Moody Tongue Brewing Co.
Use fresh, in season corn, bi-color or yellow. Remove the husks and use a dry towel to remove excess corn silk. Cut the corn into 2" round segments. Blanch in salted water for 1 minute, do not shock. Strain water, and transfer corn to a sheet pan lined with parchment paper and allow to cool. Prepare a charcoal grill, allowing coals to ignite, then burn off. We want to grill these over hot glowing coals with little to no flame. Lightly oil the corn segments in a mixing bowl, toss with kosher salt to taste. Place on grill, allowing to blister and char the corn. Take directly from the grill and toss in a mixing bowl with Calabrian Chile Jam. Serve with grated ricotta salata, torn basil and mint. Place a small plate in a freezer. Combine chile paste, lemon juice, honey and water in a stainless steel saucepan. Bring up to a simmer and reduce by 1/5 of the original volume. In a separate container, mix together pectin and sugar. Using a whisk, slowly distribute pectin into the chile and honey mixture, whisking aggressively. Turn heat up to high, and allowing to boil and thicken rapidly. The chile jam should reduce by another 1/5. Turn the heat off, and test a small spoonful of the jam on your very cold plate. If the jam sticks to the plate and does not run, it has reached a proper setting point. If it is still runny, you may have to reduce it a bit further and test it again. Cool the jam in individual mason jars or plastic deli containers for future use. Green City Market is a 501(c)(3) not for profit organization celebrating its 17th anniversary. The mission of Green City Market is to provide a marketplace for purchasing sustainably grown food and to educate, promote and connect farmers and local producers directly to chefs, restaurateurs, and the greater Chicago community. Green City Market values education about quality food and its source. Green City Market values farmers who take care of the land; the preservation of sustainably farmed land; a vibrant thriving community of local farms; and consumption of locally grown foods. Green City Market’s incredible momentum comes from its broad base of support including conscientious and caring farmers and producers, consumers, chefs, restaurateurs, and other culinary professionals. It also reflects Chicagoans' increasing concern for a more sustainable food system by improving the quality of food on the table, produced by local farmers using organic and sustainable practices that preserve the environment for future generations. GCM's support of these local artisan farmers and producers increases the density of fresh, high-quality, locally produced food in Chicago, and provides the basis for a regional cuisine. Green City Market has been a destination for locals and visitors to Chicago since its inception in 1998. It has consistently been named in the top 10 of the nation’s best farmers markets by national publications such as USA Today, Bon Appetit, Travel & Leisure, Forbes, Shape, CNN, Huffington Post and US News, among others. Wirtz Beverage Illinois is a statewide leader in the distribution of fine wine, spirits and beer brands. The company combines its time-honored tradition of execution excellence with a reputation for best-in-class service and brand building throughout Illinois. The company is a member of Wirtz Beverage Group, a leading wholesaler and broker with interests in Illinois, Iowa, Minnesota, Nevada and throughout Canada. To learn more, visit www.WirtzBev.com or engage with us on Facebook or Twitter. Green City Market Chef BBQ photos: Cindy Kurman, Kurman Communications, Inc.; Chef Tony Quartaro photo: Anjali Pinto, Photography by Anjali Pinto; Wirtz Beverage logo courtesy of Wirtz Beverage; Green City Market Chef BBQ 2015 invitation courtesy of Green City Market.